They say getting there is half the fun. Yet, I remember the hours of travel time droning on and on as a kid. Maybe that was when I was a teen. Anything with my parents was boring (add eye roll here). A good balance between diversions and together time can make the journey more memorable. Since I have a preschooler, I’ve enlisted the advice of all of my friends, family, and internet. Here are my favorites. Activity books: sticker, coloring, dot-to-dot, word find, etc. Books on CD for the whole family to listen. Get something with a little drama or juice to it in hopes that they’ll shush each other to hear. Ideally, something with a similar theme as your trip. Travel by train. Not only a memorable experience in itself, but everyone gets to relax and walk around. Separating the kids (one in front, one in back) helps. The “Let’s see who can go the longest without talking?” game. 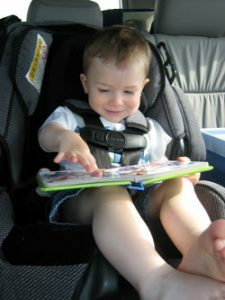 What are your favorite ways to keep the kids occupied on the way to your destination? All parents need to check out http://detentionslip.org. Voted #1 source for crazy news in public education. Hall Monitor’s link doesn’t have anything to do with travel, but could be a fun read if you want to freak yourself out! !